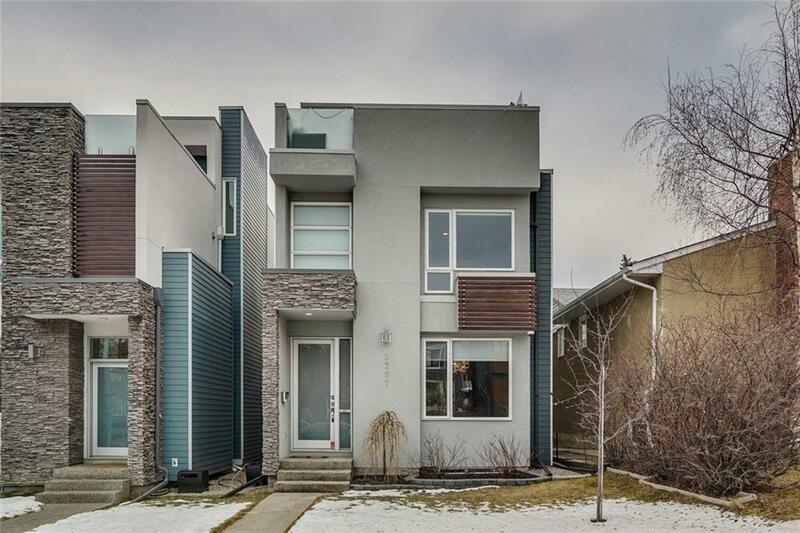 DESCRIPTION Richmond - 2207 32 Avenue SW: Custom-built 3 storey infill in Richmond with over 3,400 sqft of development. Main floor includes formal dining room,kitchen with stainless steel appliances - gas stove,double ovens,chimney hood fan;walk-in pantry,large island + breakfast bar. Kitchen is ideal for the home gourmet/entertaining. Bright,spacious living room with full-height stone gas fireplace & access to south-facing deck & fully fenced yard. Second floor features laundry room & 3 bedrooms including master bedroom with large walk-in closet,5pc ensuite featuring chromotherapy jet tub & glass shower. Enjoy the downtown view & Stampede fireworks from the rooftop patio & bright 630 sqft third floor. This space is complete with 2pc bathroom & wet bar - ideal for entertaining,office/studio or bedroom. Fully developed basement has 4th bedroom,4pc bathroom,family room with wet bar,lots of storage & heated floors. Home includes custom landscaping,insulated double garage,A/C,exterior cameras, alarm system + more.